It is my contention that when C.S. Lewis wrote his non-fiction book The Four Loves and published it in 1960, he had not been thinking about love in all of its manifestations for just a short time before it was written. All of the fictional works he wrote over the years, beginning in at least 1938, reflect his definitions and descriptions of the various kinds of love and their perversions that he systematically describes so well in The Four Loves. He does this in his fiction through his various characters and their actions. Specifically, in Out of the Silent Planet (1938), Perelandra, (1943), That Hideous Strength (1945), The Screwtape Letters(1942), The Great Divorce (1945), and Till We Have Faces (1956), Lewis demonstrates each kind of love he discusses in The Four Loves. 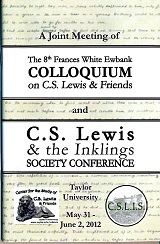 For the 2012 Colloquium, I would like to focus on Till We Have Faces in order to reveal the ways C.S. Lewis shows the reader the four kinds of love and their perversions instead of just defining and discussing the kinds of love as he does in The Four Loves. In the last chapters of The Last Battle, Lewis gives his readers a vision of the heavenly Narnia, or really of ever more real Narnias embedded within one another, people by the characters that readers have come to know through all seven books of the Chronicles, described as existing in physical bodies, though possessing abilities beyond those known in the Narnia outside the stable door (or even our own world). In this paper I will explore Lewis' representation of these "resurrection bodies" and what his representation of them means for his views on the body and the integrity of creatures, as well as the nature of his claimed Platonism. In particular, I wish to put Lewis in conversation on these issues with several thinkers from the middle ages, including Hugh of St. Victor and Thomas Aquinas, who speculated extensively on the possibility and nature of resurrected bodies. But also want to bring Lewis into conversation with some more recent thinkers, including Michael Hanby, Graham Ward, and James K.A. Smith, who have made issues about the body -- especially the body of Christ and hoped for resurrection bodies -- central to their ontological speculations. My hope is not only to understand Lewis better, but to bring his insights and images into important debates about human existence as embodied creatures. Although the Oxford University Socratic Club is most often identified with its first faculty advisor and president, C.S. Lewis, the club's inception began when several young women of Somerville College asked their newly arrived chaplain, Stella Aldwinckle, to assist them in establishing a speaker's club that would extend an open invitation to all parties who were "interested in a philosophical approach to religion . . ." The Socratic Club was an instantaneous and long-lived success, and would not have been possible without Chaplain Aldwinckle's passion, dedication, and evangelical conviction.